Today was the very first day to work on our new house! It is super cold and snowy right now, and the heat has been set on 40 in the house for a few months now. So it wasn’t below freezing inside, but pretty close. We were there for just under two hours and we got SO cold. We took the boys and they both ended up with purplish-red hands and bright cheeks. I was cold, but when I touched them, they felt like ice to me… poor little guys. We finally put Jackson in the pac-n-play snuggled with a blanket. That helped. 🙂 I carried Timothy around a lot and tried to pull nails at the same time. So, what did we accomplish? 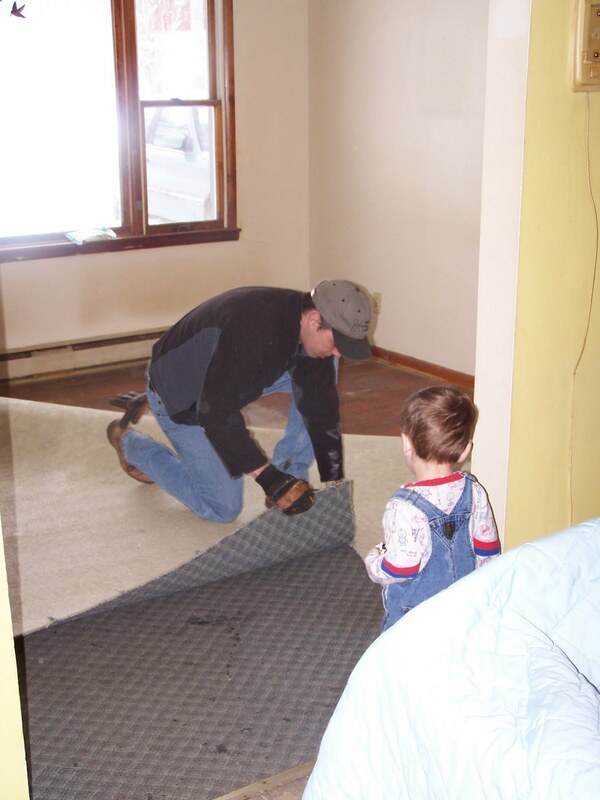 We ripped the stained, worn carpet out of the living room to make sure it had good hardwood underneath. We didn’t need any $urprises later! 😉 And… it does! Ta-da! It needs to be sanded down and polyurethaned, but so do the rest of the floors. We also pulled all the nails and the ridiculous amount of sticky hooks from the walls, and the baseboards from the floors (just in the living room). We took down the curtains and curtain rods in the whole house.